Taking Flight: New Patients, Summer Interns, and Tours Start Soon! New Patients, Summer Interns, and Tours Start Soon! Greetings! The month of May is quickly coming to a close and I did a quick count of the patients we've admitted so far. I counted just over 70 patients since May 1st and we still have a few days to go! No wonder the clinic has been buzzing with activity. I unfortunately cannot introduce you to all of the 70+ new patients so I've selected just a few. 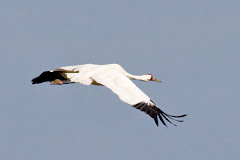 Remember the little Sandhill Crane colt from the last blog post? Well today he's nearly 2 feet tall! Young cranes grow so incredibly fast. This gorgeous bird is a male Northern Harrier (formerly known as Marsh Hawk). Harriers are one of the few species of raptors in which you can easily tell the sexes apart. Males, like the one above, are a light grey color and have been nicknamed "the grey ghost." Females are a pretty brown color. This hawk was found along a road laying on his back. Of course we don't know for sure because the hawk cannot tell us what happened, but we hypothesize he has been hit by a car. After a whole day of being unable to stand, he delighted us all by getting up on his feet Monday afternoon! This lovely bird is a Great Crested Flycatcher. He came in with a broken wing. His wings are taped now and when they heal he will be placed in our passerine flight building to regain his strength. We don't want to get ahead of ourselves, but the prognosis for this little guy looks great. This stunning male Indigo Bunting came in after colliding with a window. He has been placed in our passerine flight building to recover. He is currently unable to fly, but we will continue to monitor his improvements. These three little baby American Crows were blown 80 feet from their nest during the harsh winds last week. It's incredible that they survived such a high fall, but at least one of them is suffering from internal bleeding. Once their health improves they will hopefully be placed back where they came from so their parents can continue to raise them. Baby crows have a big apatite and a big gaping mouth! They also have light blue eyes for the first few months of their lives. These teeny baby birds have us a bit stumped. At this age it can be difficult to determine the species of baby birds because so many species can look similar as nestlings. We are thinking they may be Chipping Sparrows, but for now they are lovingly referred to as "LBJs"- little brown jobs. These little nestlings are Northern Flickers. They came in as tiny, pink, naked little things and they've grown incredibly fast. They are beginning to grow their feathers which has helped us identify them. Flickers are interesting woodpeckers because you usually find them on the ground instead of high up in trees like other species of woodpeckers. Flickers eat ground-dwelling insects, like ants and beetles, which is why they're frequently found pecking at the ground. Last week our interns began their 3-month summer internships with us and we have an additional visitor from Turkey! They are all working very hard this morning, but I managed to snap a few photos of them so I could introduce you to them. Intern, Sarah (left) and Turkish Veterinarian, Aysegul (right) are carefully tube feeding the Northern Harrier. Aysegul has come all the way from Turkey for the summer to learn more about avian rehabilitation. We are thrilled to have her joining us! Intern, Sarah from the University of Minnesota Twin-Cities is a fisheries and wildlife major with a pre-vet and wildlife emphasis. She is transferring some ducklings to an outside enclosure for the day. Intern, Maddie from Humbolt State University in California is a wildlife management and conservation major. She is transferring the young American Crows in the box she's holding to the clinic for the day. I didn't notice the giant blue dumpster from our recent construction behind her until I had already taken the photo. Hopefully we'll have time to update you on our construction projects soon! REGI summer tours are beginning again soon! The first tour day is Thursday, June 7th. Where: Raptor Education Group, Antigo, WI. When: Tuesdays, Thursdays, and the 2nd Saturday of each month from June through August at 10:00am and 1:00pm. Pre-registration is required. Have you ever looked a bird of prey in the eye? We invite you to join us in discovering the powerful beauty and unique adaptations of raptors at our facility in Antigo, WI. Let the REGI education team guide you as we explore the wonderful world of hawks, eagles, owls, and falcons. Tours are an entirely outdoors and are subject to the weather, please come prepared. Please call (715) 623-2563 to reserve your spot(s) as space is limited. I always enjoy reading your update posts! Unfortunately it seems the photos in this post are broken, at least on my computer. I see black boxes with an exclamation mark inside a triangle in each photo's place. We are having some troubles with our blog and will be working on getting those pictures back up so you can view them. Sorry for any inconvenience.